The Marvy Uchida Black Le Pens Markers have a smooth, sleek ink barrel that is color coded with the ink color. Microfine 0.3mm felt writing point with clik-fit caps. Pocket clip on cap. 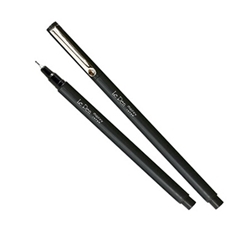 The Le Pen pens are popular for writing, scrapbooking, design, art classes, sketching and anywhere a featherlight writing or drawing marker pen is desired. Non-toxic, smudgeproof and acid-free. Black Lepens now 1/2 off at $1.10 each! The Marvy Black Le Pens have a smooth, sleek ink barrel that is color coded with the ink color. Microfine 0.3mm felt writing point with clik-fit caps. Pocket clip on cap. The Le Pen pens are popular for writing, scrapbooking, design, art classes, sketching and anywhere a featherlight writing or drawing marker pen is desired. Non-toxic, smudgeproof and acid-free. Black Lepens now 1/2 off at $1.10 each!